It's that time of year when consumers are shown a near overwhelming array of new electronics, and many of them will undoubtedly need to connect to a cellular network in order for the real fun to happen. So AT&T has announced 24 new areas around the continental US that should now have access to 4G LTE speeds, along with two more in Puerto Rico and the Virgin Islands. We have a pretty even spread of markets this time around, with faster connections popping up on both coasts, along with parts of the South, Midwest, and the Rockies. The full list of cities is available below. This brings total nationwide coverage up to over 500, a jump from the number of markets covered as of just a few weeks ago. 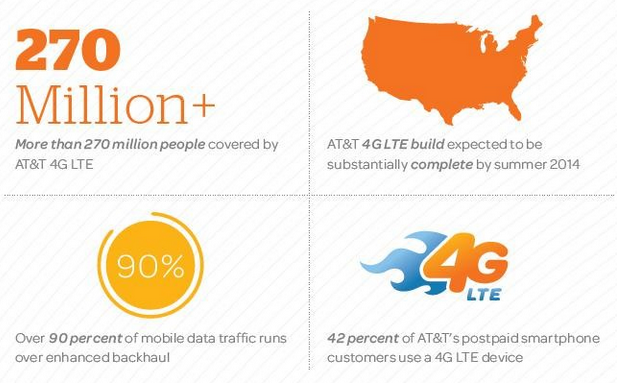 Now over 270 million people live within reach of the carrier's network. AT&T's scope still isn't as broad as Verizon's, but compared to Sprint and T-Mobile, things are looking pretty good.